If you are looking for a bedroom cabinet without mundane straight lines and box-like qualities, then have a look at this curvy drawer Brigitte side cabinet. Available in three different finishes, the cabinet brings style and creative curvature to any setting in which it is placed. Dressers and cabinets can often overwhelm the overall look of an interior, yet this perfectly sized and attractive cabinet neither intimidates nor appears too understated, achieving instead a perfect middle way in ambiance. In bedroom interiors, the bed is naturally the focal point but dressers, cabinets and tables should act as highlights and complimentary pieces which set the bed off nicely. This is definitely the case with this Brigitte side cabinet which will compliment a variety of existing decorative themes and colors, based on the choice you make regarding the three color finishes which go with the piece. 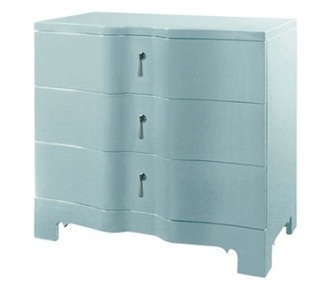 A light blue version of this curvy drawer cabinet will be super for a kid’s bedroom and reminds me of my own ‘blue room’ which I loved as a child and which had light blue painted furniture throughout. There’s plenty of space in this cabinet and the curvature of the drawers does not take away from the dimensions of the available storage area. Anything from bed linens, jeans, towels, baby accessories, underwear, tablecloths, stored appliances, board games and/or clothing accessories can be placed within. 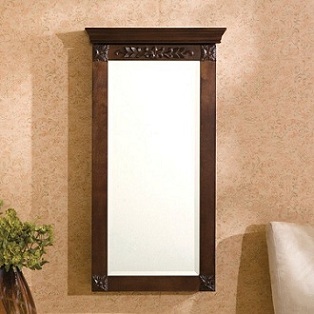 On top can be placed standing mirrors and in front a chair can be situated to turn it into a regular dressing table. For a children’s room, small colourful and tasteful stickies can be attached and thus heighten the decorative impact of the cabinet. You can buy this cabinet here: Brigitte Side Cabinet with Curvy Drawers. Comes with hand-finished chrome pulls and steel drawer guides.